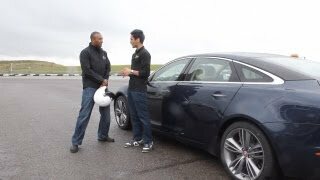 Jaguar XJ 2012 gets two new performance driven option packs - Sports Pack and Speed Pack. The Sport Pack consists of exterior and interior design options to enhance the car's personality. The Speed Pack, exclusive to supercharged models, raises the electronically limited top speed from 155 mph (250km/h) to 174 mph (280 km/h). 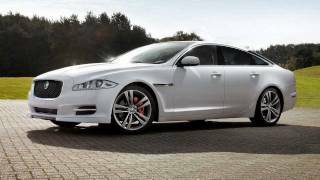 These two option packs for Jaguar XJ were unveiled at the Dubai Auto Show. Aerodynamically optimised styling changes to front and rear. New 20-inch alloy wheel design. Red painted brake callipers with Jaguar script. Additional interior trim choices mean even greater colour and veneer combinations. New Speed Pack - exclusive to supercharged models with exterior Sport Pack - raises the electronically limited top speed from 155mph (250km/h) to 174mph (280km/h). Sport and Speed Packs are available in standard and long wheelbase variants. 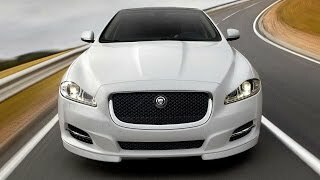 XJ awarded International Luxury Car of the Year at the 2011 ICOTY awards. The XJ's Advanced Aluminium Architecture offers weight-savings of up to 150kg compared to its competitors. Range of engines includes twin-turbocharged V6 diesel, 3.0-litre V6 petrol and naturally aspirated and supercharged petrol V8s. Jaguar's award-winning flagship XJ saloon - which combines elegance, drama and sporting prowess - is now available with optional Sport and Speed Packs to further emphasise the performance aspect of its character. The Sport Pack - available throughout the XJ range - comprises a number of exterior and interior design options that clearly underline the assertive side of the car's personality. Externally the appearance of the XJ has been made even more dramatic with the addition of aerodynamically optimised changes to the bodywork and an alloy wheel design specific to the Sport Pack. "The XJ is much more than a limousine. Its power and potential mean it can out-perform many so-called sports cars. The new Sport and Speed Packs allow customers to enhance that sporting dynamism even further and create an XJ that looks as good as it drives." The result of extensive research in the wind tunnel and on track, the front of the car gains an aerodynamic splitter beneath the bumper to direct air beneath the car to reduce lift, and at the rear the bootlid lip has been extended to ensure a clean separation of air from the trailing edge of the bodywork. While ensuring optimal stability at high-speed, the Sport Pack maintains the standard XJ's sleek 0.29Cd aerodynamic figure. These changes have been reinforced with a number of cosmetic additions that clearly distinguish the Sport Pack-equipped cars from other models. The bold Jaguar radiator grille, a key feature in the XJ's assertive face with its strong 'rear view mirror recognition' factor gains a gloss black mesh finish with the same treatment applied to the lower air opening and side vents. Red painted brake calipers emblazoned with the Jaguar name are mounted behind new 20-inch 'Venom' alloy wheels with a diamond-turned sparkle silver finish to their eye-catching five split-spoke design. Newly designed split twin tailpipes (not available from launch) will leave other drivers in no doubt as to what car has just passed them. The front seats are Jaguar's Performance version, which offer superb support for spirited driving. Trimmed in softgrain leather these offer a huge range of adjustment - including the enlarged side bolsters - to create a perfectly tailored driving position. Active ventilation supplies heated or chilled air as required to each individual front seats. At the driver's feet sit purposeful machined stainless steel pedals engraved with the Jaguar name. The rear seats have been trimmed to match the front pair and the Sport specification will be offered in two purposeful colourways of Jet over Jet or Jet over Ivory. The eye-catching Piano Black trim that highlights certain touch surfaces in the XJ is contrasted in the Sport specification by subtly applied carbon-fibre highlights. "A car capable of 174mph must have certain basic attributes - stability, aerodynamics, prodigious power and as little weight as possible. The XJ is blessed with all these qualities in abundance and with the addition of the Speed Pack it becomes an ever more impressive performance saloon." The XJ benefits from superb aerodynamics and Jaguar's innovative lightweight aluminium architecture to offer weight savings of up to 150kg over its competitors. This offers tangible benefits in terms of economy, emissions, driving dynamics, agility and, of course, performance. With such prodigious power already available from the supercharged petrol engines, no increase was necessary to achieve the higher top speed. The only changes necessary were a recalibrated engine management system, reworked software for the innovative virtual instrument display and adjustment to the tyre pressure monitoring system to take into account the heat generated by sustained high-speed motoring.